Savotta LJK Modular Finnish Forces Backpack 80L. Top of the range in every respect, this outstanding, modular pack is made for Heavy Duty Military use. The totally redesigned pack has the ultra durable DUR Ali frame, 1000D cordura fabric, Delrin buckles and HD Kroko zippers. Its a modular (pack it up, pack it down!) backpack that is flexible to suit your trip and offers extended stays or short trip, practicality. Really outstanding piece of kit. 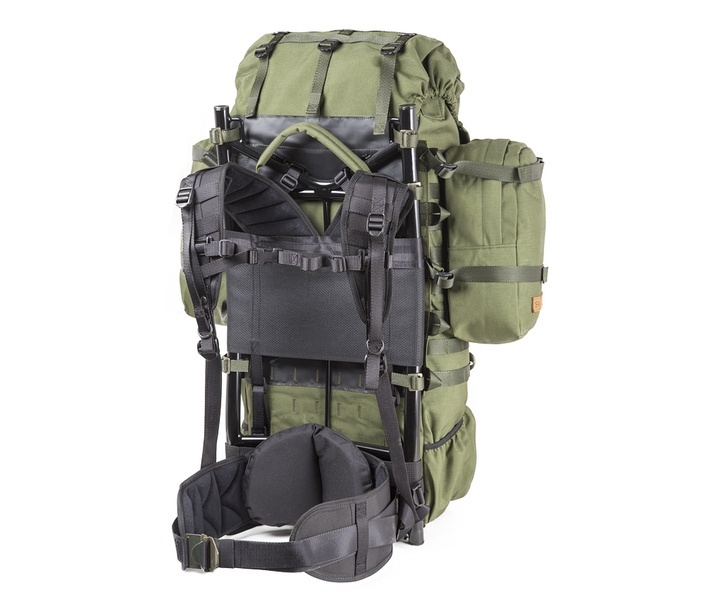 A new modular, heavy-duty external frame backpack for special and intelligence forces designed for the Finnish Defence Forces. The modular LJK was designed to meet the needs of the armed forces for a modern military rucksack. The features and details have been thought out according to the needs of the 21st century without compromising durability and reliability in extremely heavy military use. The rucksack can be customised to suit your needs with separate pockets and numerous attachments points. There is not much left of the old LJK rucksack except the name, external frame design and a structure that can withstand pretty much anything. The compartments and structure of the entire rucksack have been designed anew from scratch. The end result is more practical than before and considerably more versatile. The modular LJK has also been found to be a functional and reliable carrying device when used by the Finnish Defence Forces and the Finnish Border Guard. A traditional external frame backpack is at its best with a heavy load but is equally suitable for lighter outings as well. The external pipe frame allows air circulation between the bag itself and the back of the user, reducing the heat load significantly. Although anatomical rucksacks have taken over some turf in the rucksack market, there are still situations where nothing beats an external frame backpack. The top compartment of the bag (dimensions approximately 50 x 35 x 25 cm) is closed by tightening the drawstring opening which is secured with a waterproof protective collar which enables overpacking as well. The opening is covered first with a buckled securing and tightening strap, after which it is covered with a generously sized flap which is secured with buckled straps. The straps are long enough for carrying, for example, a sleeping bag or mat under the flap. In addition to the buckles on the straps, there are spare metal buckles under the flap in case of a worst case scenario. The top and bottom compartments of the bag are separated by a divider that can be opened, meaning that the whole bag can be turned into one big compartment, if desired. There is a mesh pouch for small items inside the top compartment. The pouch can also hold a wide hydration bladder and there are outlets for its tubes on each top corner of the rucksack. The bottom compartment of the bag (dimensions approximately 35 x 35 x 25 cm) is closed with a two-way zipper which is secured with two buckles. The buckles should always be fastened because they take some of the weight and strain off the zippers. The side pockets (dimensions approximately 30 x 17 x 11 cm) open from the top with long zippers. The side pockets are detachable and can be attached to the height necessary on the sides or the back of the rucksack. They can also be left out completely, if desired. 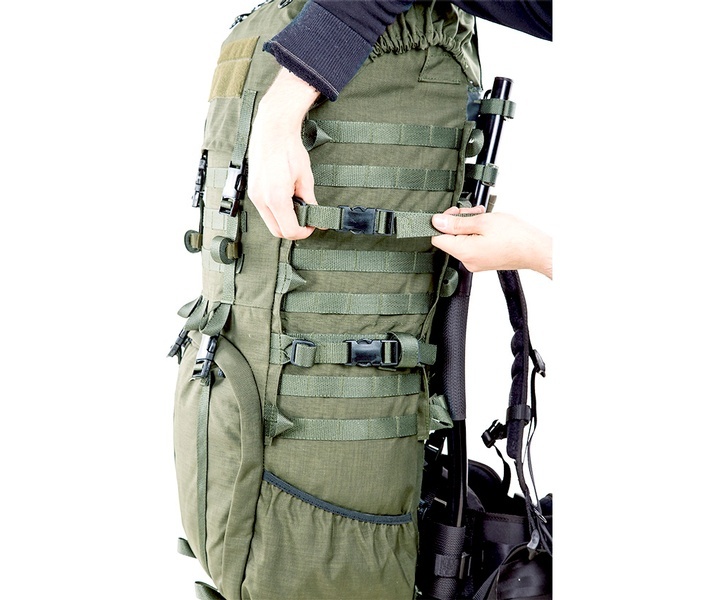 The pockets are attached to the rucksack with MOLLE webbing used in military equipment. It is a very simple, durable and reliable method of attachment. There is a generous number of attachment loops on top of the flap and inside the main compartment. With these, it is possible to tie even large loads (such as the beloved Sissi tent) on top of or under the flap securely by using detachable straps. The loops on the inside of the flap are perfect for attaching a sleeping mat. Especially a military-style tent mattress can be very conveniently attached to these by its elastic bands. 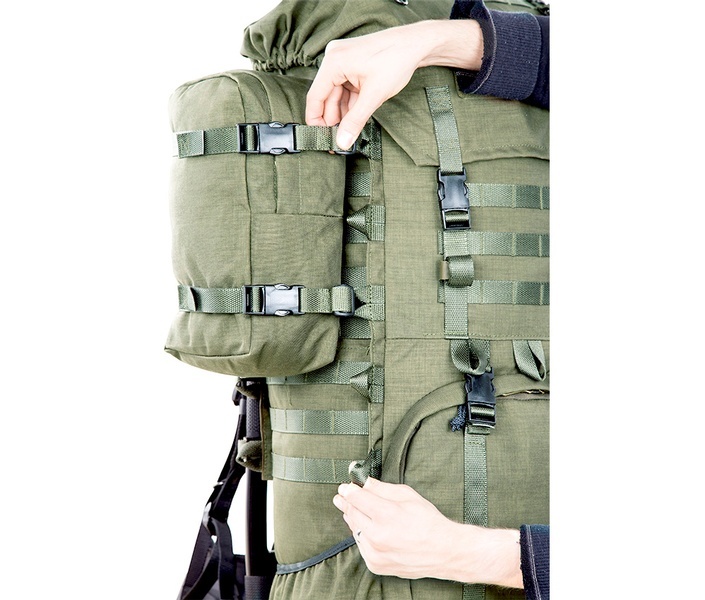 There are several strap loops on the sides and back of the rucksack to which it is possible to tie a variety of supplies with detachable straps. The rucksack comes with four two-part buckled straps that can be moved freely between the attachment points of the rucksack. By default, they are used to reinforce the attachment of the side pockets. There is plenty of MOLLE webbing on top of the flap, on the sides, back and bottom of the bag and inside the bottom compartment for attaching additional pockets. You can also easily tie supplies to the webbing by using detachable straps. The bottom corners of the bag have open compartments to secure long pieces of equipment, e.g. an axe handle, to the side of the rucksack. The bottom corners of the shoulder straps have loops which act as attachment points for small items, such as water bottles. The frame of the carrying system is the strong aluminium pipe frame of the LJK model. Contrary to civilian rucksacks, this does not have an upper curve because the curve gets easily in the way of the head when it is necessary to move in rough terrain. Furthermore, the frame has been reinforced with additional support blocks. The shoulder straps and hip belt are firmly padded and anatomically shaped. In addition, the lower back is supported by a separate, thick padding pillow. The buckle of the hip belt is a special plastic buckle which can be tightened in both directions and can be opened by pressing the middle. The buckled chest strap provides extra comfort and support for carrying. 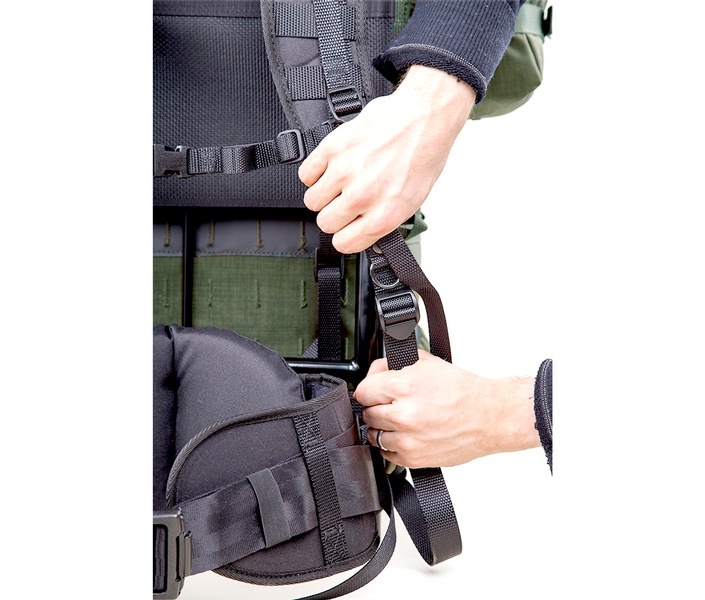 The continuously adjustable (in length and in width) supportive carrying system and hip belt of the rucksack can be adjusted to suit users of all different heights and sizes. It is possible to adjust the centre of gravity of the shoulder straps even while walking by tightening and loosening the straps attached to the top of the frame. The centre of gravity of the rucksack itself between the shoulders and the hips is adjusted by loosening and tightening the shoulder straps and hip belt. External dimensions: height 80 cm, width 60 cm, depth 30 cm. Materials: 1000D Cordura, polyester strap, Delrin special plastic buckles and Kroko zippers. The product has a 10-year guarantee against material and manufacturing defects. This Finnish Key Flag product is partly manufactured on our factory in Estonia, however more than 50 % of its work is made in Finland. Purchase through PayPal by using the "Add To Cart" button above or use the form below to order the Savotta LJK Modular Finnish Army Backpack 80L . 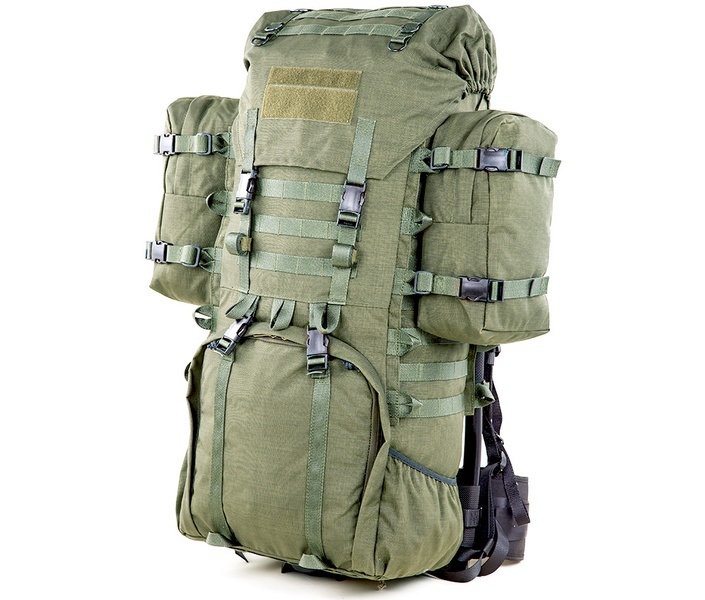 Feel free to contact us if you have any questions about the Savotta LJK Modular Finnish Army Backpack 80L .